Reviews so far: "A Research Agenda for Neoliberalism"
Here are some reviews of my book A Research Agenda for Neoliberalism, which is actually out in paperback now, so at least somewhere near affordable if anyone is interested in it. I thought I'd put the reviews in one place, probably more for my own benefit than anyone else. I'll add to them as more come in; or should that be, if more come in! Christopher May (Lancaster, UK) in LSE Review of Books (2018) - see here. I know there's another critical one coming my way soon, as I was invited to write a response to it, so I'll add that once it's up online. More to come ... hopefully! It's been a while since I've actually written anything resembling a blog post, as opposed to some sort of publicity for an event or publication I'm involved in. So, I thought I'd do one today! Since it's the start of a new year, and everyone else seems to do this sort of thing round about now, I thought I'd create a short listicle of interesting (academic) books I've read over the last year (although my memory is a little hazy so it might end up being the last two years). - Mariana Mazzucato (2018) The Value of Everything: it's nice to see a book like this come out and receive serious mainstream attention, since it touches on a range of issues that'll come more to the fore in coming years (not that they've been missing, just under-appreciated) - this includes, problems with tech monopolies, accounting standards, financial logics, rentiership, etc. - Philip Mirowski & Edward Nik-Khah (2017) The Knowledge We Have Lost in Information: this is a really fascinating intellectual history of the way 'knowledge' has been conceptualized in economics (& in different, contrasting ways to book), stretching back to Hayek's original formulation of the "Problem of knowledge" (1945). It's relevant across a range of topics, but I find it most interesting when trying to think through some of the current issues with social media and the way we can 'game' the system - see this classic example here, "The Shed in Dulwich". Basically, knowledge is often treated as an unreconstructed object, rather than a reflexive and dynamic interplay between social actors who are always reinterpreting what each other claims. Great read. - Aaron Perzanowski & Jason Schultz (2016) The End of Ownership: an in-depth look at how personal property is changing in contemporary, technoscientific capitalism - & the implications of this. It examines changing digital property relations when it comes to intellectual property as well as copying, cloud and streaming platforms, digital rights management, internet of things, and so on. I'd describe it as an eye-opener for anyone interested in where we might all end up. - Jonathan Haskel & Stian Westlake (2018) Capitalism without Capital: this book delves in all the issues I'm currently interested in; intangibles, their valuation, accounting practices, investment dynamics, etc., etc. It also deals with the consequences of the 'rise of the intangibles economy' - their sub-title - such as monopoly (again! ), inequality, productivity collapse, rent-seeking, etc. None of these books is, by any standards, perfect, or without flaws, but they all offer a useful addition to the literature about contemporary, technoscientific capitalism - how we got here, what are the implications, how we might mitigate the worse effects, and so on. 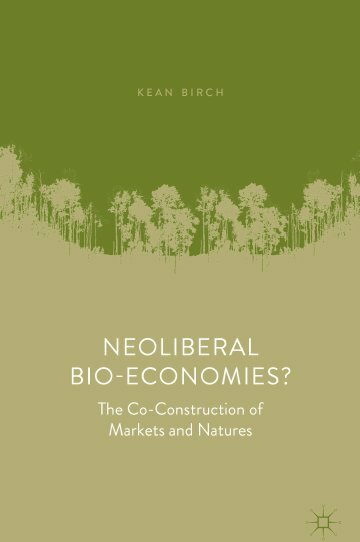 Here's the cover of my new book, which is hopefully coming out later this year with Palgrave Macmillan: "Neoliberal Bio-economies? The Co-construction of Markets and Natures". 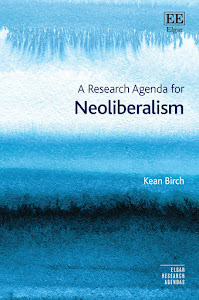 Repost from Conversation Canada: What exactly is neoliberalism? 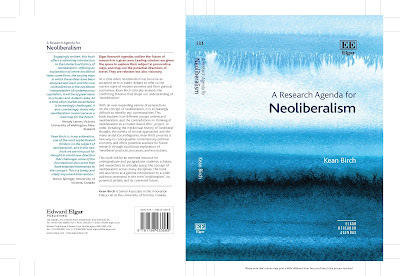 I struggle with neoliberalism – as a problematic economic system we might want to change – and as an analytical term people increasingly use to describe that system. I’ve been reading and writing about the concept for more than a decade. But the more I read, the more I think that neoliberalism is losing its analytical edge. Neoliberalism is generally associated with policies like cutting trade tariffs and barriers. Its influence has liberalized the international movement of capital, and limited the power of trade unions. It’s broken up state-owned enterprises, sold off public assets and generally opened up our lives to dominance by market thinking. As a term, neoliberalism is increasingly used across popular media, including The New York Times, The Times (of London) and The Daily Mail. It’s also used within international institutions like the World Economic Forum, the Organisation for Economic Co-operation and Development and the International Monetary Fund. "I want to start this blog by writing about tractors. Writing on the Motherboard website, Jason Koebler argues that American farmers are buying black-market software from Ukraine in order to hack their John Deere – and other manufacturer – tractors because those manufacturers have made it increasingly legally difficult to do “unauthorized repairs” on those tractors. This is because, as part of their license agreements with tractor manufacturers, farmers are forbidden from “tampering” with their tractor’s software. It all sounds like the plot of a William Gibson novel". Rest of the blog can be read here.